When Chrissy saw an opportunity to be a Ballpark Banker for the Phillies home games at Citizens Bank Park, she couldn’t submit the application fast enough. “By being a part of this unique program, I’m able to bring my banking expertise to the ballpark while increasing awareness of our great financial services and the Citizens culture,” adds Chrissy, Philadelphia-based branch manager II. 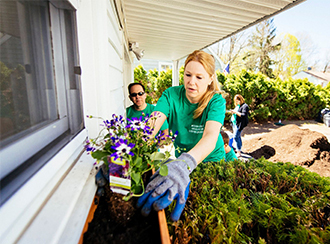 Launched in 2004 with the opening of Citizens Bank Park in Philadelphia, PA, the Ballpark Bankers program is a one-of-a-kind ambassador program available to Citizen Bank colleagues in the local Philadelphia area. A select squad of banking colleagues brings the Citizens brand to life and provides a great experience for the 45,000 fans who visit Citizens Bank Park for each home game. 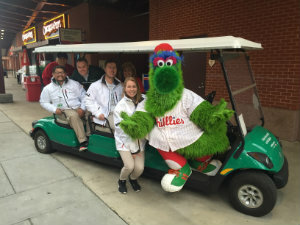 They truly enhance the Phillies fan experience by providing courtesy golf cart rides from the parking lots to the gates, distributing Citizens Bank giveaways and engaging fans in conversation. The program aims to deliver a great customer service experience, while allowing colleagues from all areas of the bank to make an impact in the Philadelphia baseball community. 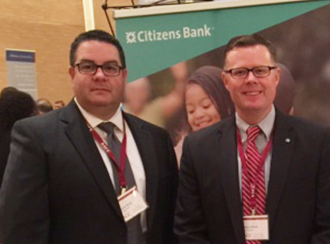 Ballpark Bankers actively promote Citizens products and services as well as lead the bank’s Phillies-related community initiatives, such as involvement with the Phillies Jr. RBI Program and Phans Feeding Families. Ballpark Bankers are chosen through a selective application process at Citizens. Each Ballpark Banker is given a rotating schedule of Phillies regular-season home games between April and October, working an average of seven games during the six-month season. The Ballpark Bankers program is just one of the many community outreach efforts led by Citizens Bank. 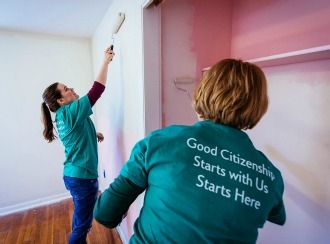 These efforts not only provide our colleagues with the chance to become involved with their community, but also offer them exciting career opportunities that are fun and engaging.